Say hello to art in a charming and laid back café setting. 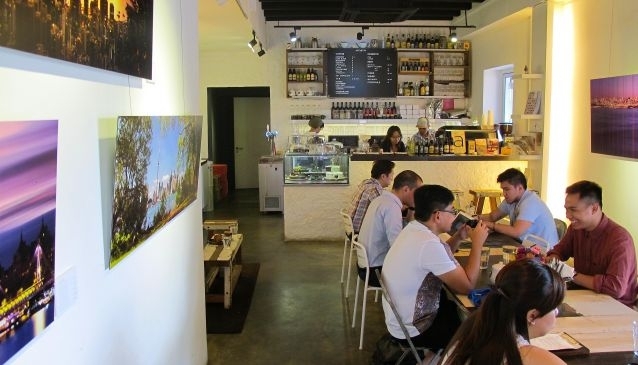 Housed in a refurbished vintage shophouse in eclectic Haji Lane in Kampong Glam, the art gallery is a sophisticated player in the growing art scene in Singapore. The inviting aroma of brewed coffee complements the stimulating artworks by local and international budding talents. Artistry creates the much awaited room for these artists to put up exhibitions and performances for the public. One such exhibition entitled 'Dreamscapes', is a collection of fantasy landscapes by two revolutionary female photographers. Now who says going to an art gallery is an intimidating affair for the inexperienced?